The front page of the “current affairs” section of The Paper on July 6, 2016. Reading the paper was an essential ritual of my childhood. I remember tiptoeing out with bare feet some days, the frost still glistening on the front lawn, to retrieve the rubber-banded bundle from wherever the local paperboy had managed to land it. Across the expanse of our dining room table, the affairs of the day were assiduously discussed, and the “funny pages” devoured. This personal association lends a certain genius to the name of the publication we are told is revolutionising media in the People’s Republic of China. The Paper, or Pengpai (澎湃) in Chinese, promises to be a 21st century paperboy, putting a world of relevance at your fingertips through a mobile app that is slick, simple and responsive. It is not just a paper; it is the paper. This new media phenomenon, which will celebrate its second birthday on July 22, has generated a great deal of buzz over the past two years. Some thought at the start that it might herald a new age of bold and creative media, not unlike Guangzhou’s Southern Weekly two decades ago. This fantasy was fuelled to some extent by the opening salvo, written by the app’s new CEO, Qiu Bing (邱兵). It recalled the hopeful era of the 1980s, when media reform, or xinwen gaige (新闻改革), was a rallying cry and even the editor-in-chief of the Party’s official People’s Daily was a liberal-minded champion of press freedom. Lu Wei, head of the Cyberspace Administration of China (seated) visits The Paper on July 18, 2014. Who is that man on the far left, over Lu’s shoulder? Others have rightly urged caution in assessing the significance of a publication launched with such fanfare in the midst of one of the worst press crackdowns China has seen in decades. A chief architect of that crackdown, Lu Wei, the powerful head of the then fledgling Cyberspace Administration of China, even visited The Paper on the eve of its launch, resulting in a photo op reminiscent of presidential visits to the likes of the People’s Daily and Xinhua News Agency — visits that, like Xi Jinping’s last February, always mark important statements on media policy. How, the sceptics have asked, can a publication with investment from the state-run Shanghai United Media Group, and support from the CAC and the Shanghai leadership, be a trailblazer in an imagined new era of media idealism? Two years on, we have a fresh perspective on The Paper and that early visit by Lu Wei. Aside from China’s internet tsar, no one in the July 2014 photo op was captioned in The Paper’s own coverage of the event. Take another look, however, and you’ll note a point of resonance with recent news. The man standing over Lu Wei’s right shoulder is Xu Lin (徐麟), who was announced last week as the new head of the CAC, replacing Lu. Xu Lin was the chief of propaganda in Shanghai at the time, and a member of the city’s Party standing committee, a post he had held since May 2013. Xu is known to be a favoured protege of Xi Jinping. In a single image now, we have two successive heads of the Cyberspace Administration of China, a body that will likely reshape the nature of news and propaganda for years to come. And how fitting it is that this image should date to the birth of the media product that is intended to blaze the way forward — a news app in the Party’s pocket, yet young enough and savvy enough to command the loving attention of the mobile public. 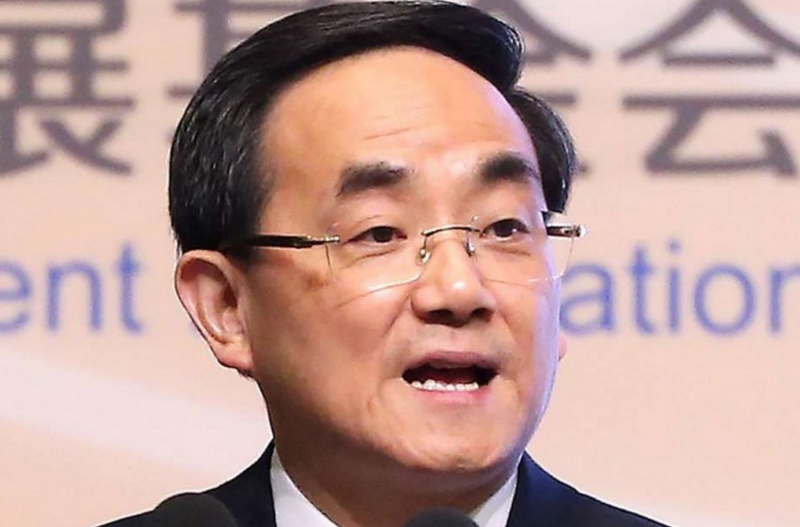 Nor should we forget that both date of birth and geography link The Paper to China’s new official forum on internet development, the so-called “Wuzhen Summit” — or World Internet Conference (WIC) — that Lu Wei announced just three months after his visit to The Paper, along with news that China would strengthen regulation of news apps. The conference at Wuzhen, which Xi Jinping envisions as a core platform for pushing China’s unique “internet management path” and its notion of cyber-sovereignty, is just 105 kilometres southwest of The Paper’s offices in Shanghai. Here, in the fertile lands between Shanghai and Hangzhou, we have the spiritual centre of Xi Jinping’s grand new vision of information and Party governance in the 21st century. It is a vivid image. Propaganda reports as chujiao (触角), as tentacles or feelers. And isn’t that what The Paper is all about? Propaganda can no longer repulse, as it has so often done in the past, with its dead and colourless reports. It must attract. More to the point, it must attach. It must reach out to us and attach itself to us. Draw us in, and lead us along. We must say: What a wondrous creature this is! Look at the way it lives and breathes, and coils itself around our lives! This is only a wondrous vision, of course. Xi Jinping’s Chinese dream of what might be in the age of the mobile internet. And recent history — the same history that informs the CCP’s sense of lost control over the agenda — reminds us that such visions can go wrong. 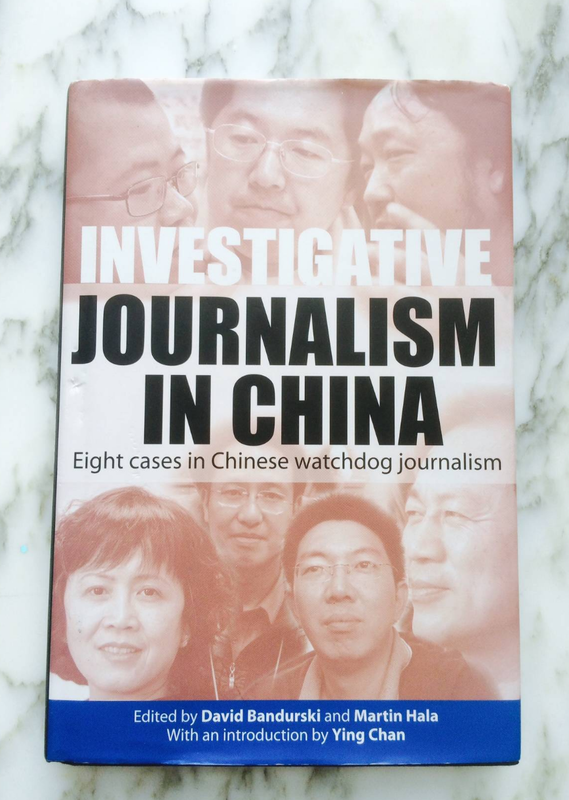 Published by the Hong Kong University Press, this book reviews the tradition of investigative reporting in China from the 1990s through to 2003. In the 1990s, national strength was one key driver behind media development, with the idea that China might create commercial media leviathans to do battle with the West. They were called, revealingly, hangkong mujian (航空母舰), “aircraft carriers” — media groups spanning print, internet and broadcast that could scale like Rupert Murdoch’s News Corp. Those media, including a new generation of commercial newspapers and magazines, ultimately posed a challenge to the official agenda, culminating 13 years ago. In the 1990s, and through to the end of the last decade, the spirit of media reform from the 1980s found fertile ground in a revolution of commercial innovation and social and economic transformation, even fostering a movement of investigative reporting in China that was truly world-class. We shouldn’t forget that experiments can go wrong, that ventures like The Paper could push coverage in directions that are unwelcome depending on the larger social and political environment. For now, though, The Paper is Xi Jinping’s wondrous creature, the archetype of what we might call the Wuzhen Model (乌镇模式) of propaganda relevance and information control. The Party recognises that the next revolution in information products is already upon us, and one of Xi Jinping’s central agendas is to ensure that this revolution happens in a controlled environment. For that to happen, the Party has to find the sweet spot between meeting demand and making demands. The Paper is part of this search for the Holy Grail of “news and public opinion work”: the propaganda vehicle that works like a magic chalice, filling up with whatever a reader desires. The Paper can be seen as one of a number of experiments being carried out by the current government in using new media for propaganda work, and right now it seems to be very successful. I mean no disrespect to Qiu Bing’s founding idealism at The Paper. But I don’t need to return even to the optimism of the 1980s. I remember with nostalgia already the great work that came in the 1990s, in the midst of the last uncontrolled burst of media innovation — and which continues against immense odds at places like Caixin. Which is why, giving The Paper the benefit of the doubt, I come to read it with higher expectations. If we are to believe, as some still do, that The Paper pushes the envelope, it needs at the very least to reach the minimum professional bar set by commercial print media and their online sites over the past decade and a half. So, what is it like to read The Paper? To find out for myself, I decided to conduct an experiment, reading The Paper as I would have read the paper of my childhood: cover to cover, over the course of a morning. Reading The Paper is an enjoyable experience. The publication is a simple pleasure to navigate, with a scrolling mobile interface that is tidy and straight-forward. If you’re on the website, the content tabs lead you easily where you want to go: current affairs, finance, lifestyle, ideas. The subcategories are inventive, sometimes punchy. There is a section on food, for example, called zhishifenzi (知食分子), a clever play on the word “intellectual” but incorporating the word “food” instead of “knowledge” — something like “food-ologist,” though that is a very poor translation. There is also meishuke (美数课), a creative look at numbers in the news, or the news through numbers, or the science behind the simplest of questions. For example, there is this clickbait piece, based on material from the Smithsonian, about why mosquitoes bite certain people and not others. If you’d like to request updates on a news topic that interests you, The Paper has made this simple. Let’s say you’re reading this article on corruption in Sichuan province under The Paper’s “Striking Tigers” (打虎记) section. All you need to do is touch the “follow” button at the bottom and you’ll receive updates whenever they become available. 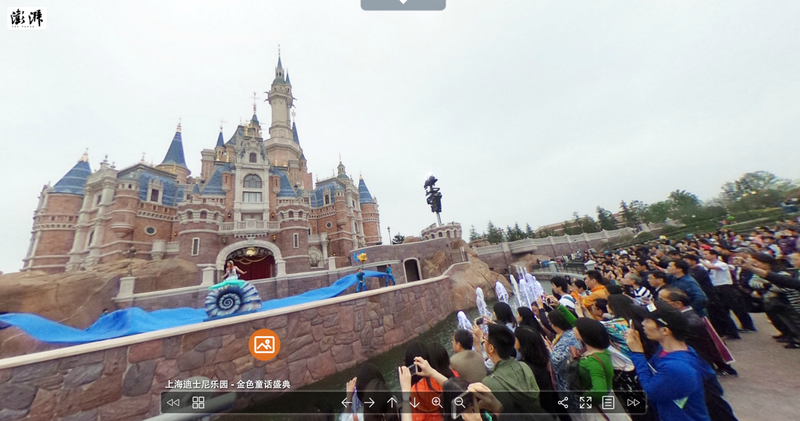 Screen capture of panoramic feature on Shanghai Disneyland at The Paper. The Paper makes good use of new media techniques such as 360 degree images that give you a rich sense of space and context. These are aggregated under its “Panoramic Scene” section (全景现场), where there are addicting visual snack foods like this panorama outside Shanghai Disneyland, or this one outside the site of the Chinese Communist Party’s first national congress in 1921. 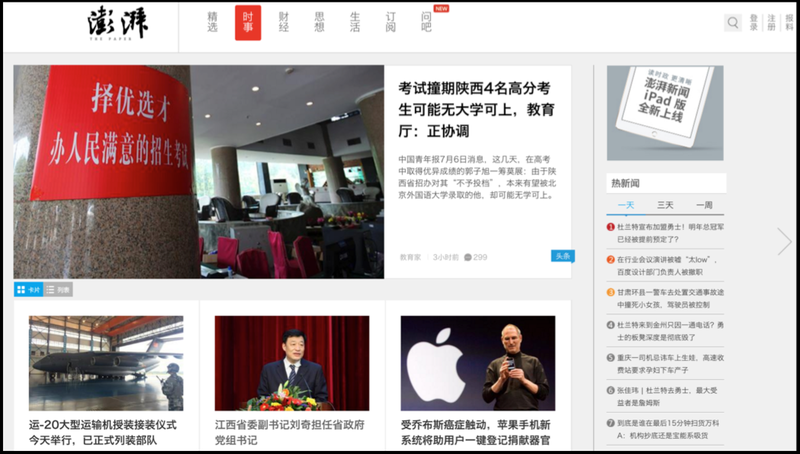 Then there is “Translating China” (译中国), a collection of overseas news reports about China translated into Chinese, a kind of contemporary, mobile-savvy version of the old-school Reference News, or cankao xiaoxi (参考消息). For example, there is a story from Japan’s Asahi Shinbun about young Chinese entrepreneurs gathering at a local coffee place in Zhongguancun that has become a watering hole for creativity. Or this one by Marc Bain at Quartz about how Europe has been hit by a downturn in luxury buying by Chinese tourists. Or this one from the Los Angeles Times about how online shopping is taking root in China’s connected countryside. The app/site also has a fair degree of interactivity built in, especially now with its new “Go Ahead and Ask” (问吧) section, where you can leave your queries — about personal network security, for example, or the Euro Cup — with a range of related experts. But if The Paper is to compete with the paper, my paper, it has to deliver the news. So I brewed myself a pot of coffee and gave The Paper roughly five cups to sell me on its substance. In that time, I was able to read 46 articles in the current affairs section — where I expected to find the most potent stuff — taking each article as it appeared on the website version. Here are my notes, indicating the source of the material (other media or exclusive? ), general topic and reporting. * On police responder in Gansu province whose vehicle struck a young girl as he was heading to the scene of an accident — SOURCE: The Paper based on social media accounts, using county police sources with no additional reporting, no response from family or others. * On appointment of Tu Guangshao as general manager of China Investment Corporation — SOURCE: Oriental Morning Post, no additional reporting. ROW 2 / *On release of a White Paper from the Second Intermediate Court in Shanghai concerning contract disputes in property transactions— SOURCE: court. *On flood response in Anhui province — SOURCE: compilation of official government Weibo releases, quoting head of response team, with images of troop mobilisation and cheering crowds. *On a truck driver fined for eating a popsicle while driving — SOURCE: Dushi Kuaibao, a commercial spinoff of the official Hangzhou Daily. ROW 3 / *About the beating of an unlicensed vehicle owner by county authorities in Sichuan — SOURCE: Sichuan Online, the official provincial news website. *About opening of underground tunnels connecting four buildings in Lujiazui, Shanghai (soft news) — SOURCE: unclear. *On the removal of villagers from the flood zone, very pretty positive story on governemnt response — SOURCE: China Central Television. ROW 4/ *About deputy district chief in Guangzhou found to have bought an apartment for his mistress — SOURCE: Information Times. *On handling of 168 corruption cases in Hunan during the first six months of 2016 — SOURCE: Hunan’s official discipline inspection website. ROW 5 / *explanatory piece on El Nino and how it can create flooding in China (no substantive coverage) — SOURCE: China Meteorological Association (government). *About a Shaanxi village official who died in a car crash — SOURCE: Huashang Bao, a major commercial newspaper. *Routine notice on Party personnel shifts — SOURCE: Ministry of Human Resources and Social Security. ROW 6 / *Typical Party news release on Xi Jinping’s written remarks to the G20 Civil Society forum being held in Qingdao — SOURCE: Xinhua News Agency. *Infographic on flooding and number of people in various regions affected, no additional context or reporting — SOURCE: The Paper. 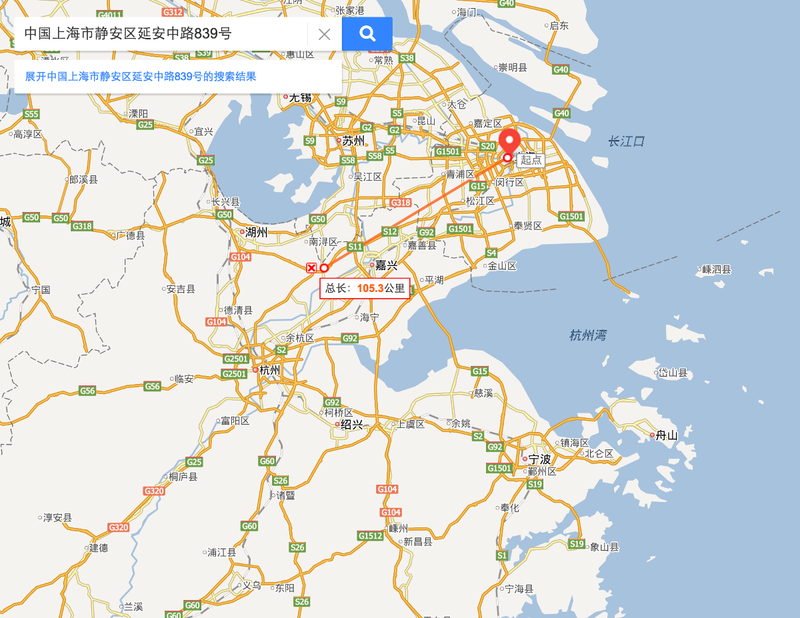 *Story of faulty train cars sent from Singapore back to China — SOURCE Global Times. ROW 7 / *On Southern University of Science and Technology graduation ceremony — SOURCE: Nanfang Daily. *On local officials in Shaanxi abusing power to eat for free at private restaurants. Classic “swatting flies” coverage, but best in the entire list so far. Still, not from The Paper — SOURCE: Huashang Bao again. *On woman in Shaanxi who attacked a child thinking he was talking behind her back. SOURCE: social media, with confirmation of case details by The Paper with police in Ankang City. ROW 8 / *On organ donation with statistics from an organ donation forum in Shanghai (event report) — SOURCE: Shanghai Red Cross. *On severe weather in Inner Mongolia — SOURCE: Inner Mongolia’s official gov’t website. *On the use of dogs to protect cultural relics in Sichuan — SOURCE: Chengdu Commercial Daily. ROW 9 / *Article about a ludicrous hukou request from a resident in Chongqing — SOURCE: Chongqing Morning Post. *Quirky story about a truck driver who helped a pregnant woman give birth in Sichuan — SOURCE: Chongqing Morning Post. ROW 10 / *Interview with Dai Bingguo, who says tribunal decision on the South China Sea islands dispute is “trash paper” — SOURCE: Global Times. *About a Chinese tour group whose passports were lost in Sweden, reimbursed by travel agency — SOURCE: Jinghua Times, a People’s Daily spinoff. *Reposting of article from Guangming Daily, published by the Central Propaganda Department. ROW 11 / *Piece on Xi Jinping’s remarks about a “China Plan,” link goes to special page on Xi Jinping’s speeches, etc — SOURCE: Xinhua News Agency. *On the suicide of a couple in a Nanjing hotel — SOURCE: official Weibo account of Nanjing local police. *On a man whose pigs were purchased by a company after news of their plight in serious flooding became national news — SOURCE: The Paper. ROW 12 / *On new regulations in Beijing about traffic crossings — SOURCE: Beijing Youth Daily. *Emotional story about a man in Guangxi who dressed as Spider Man and solicited donations for his seriously ill child, who eventually died — SOURCE Jinghua Times, a spinoff of the People’s Daily. *Repost of People’s Daily article that was a speech by the Party Secretary of Gansu Province. ROW 13 / *Article on goldmine accident, where 4 are still missing — SOURCE: China News Service. *On appointment of new diplomats in Ireland and other countries — SOURCE: Xinhua News Agency. *Another bizarre story of rude behaviour at the grassroots, this time in Fuzhou, where a defendant sprayed a burning substance on some poor woman’s legs “for excitement” — SOURCE: China News Service. ROW 14 / *Xi Jinping offers his regards after the terror attack in Bangladesh — SOURCE: Xinhua. *About raising of a red signal in Wuhan amidst serious flooding — SOURCE: all official government Weibo information. *About how the US should not create tensions in the South China Sea — SOURCE: the People’s Daily. ROW 15 / *About an accident that resulted in the death of PLA soldier during training in Heilongjiang — SOURCE: Jinghua Times (People’s Daily spinoff). *Premier Li Keqiang visits Hunan amid serious flooding — SOURCE: Xinhua official Weibo. *Special timeline and photo slideshow of flooding across China — SOURCES all official. This brought me to the end of my morning coffee. And I must say that this unscientific study of The Paper certainly gives credence to the view that it is “a new bottle for old wine” (新瓶旧酒). Even if we overlook the fact that virtually 100 percent of my read — again, of 46 articles — comes from sources other than The Paper, this is very thin wine indeed. The only stories of substance at all dealt with small-time abuse of power in Shaanxi (Huashang Bao), the recall of China-made train cars from Singapore (Global Times) and an accident at a goldmine (China News Service). Based on this reading, I would say that The Paper is precisely a “new bottle,” using a newly-designed interactive interface to deliver typical content from 1) trusted traditional media sources and 2) official government websites and social media accounts. You might say that my lacklustre morning read was just a matter of the draw. After all, more interesting stories do pop up at The Paper, like this one today on a man who found his mother buried under a pile of demolition rubble after she had been missing for 21 days. The Paper seems to have a reporter on the scene, and offers a short video too. But here the reporting is lacklustre. The local propaganda department in Changsha is the chief source at the top of the story, and the facts are virtually identical to another story from the Legal Mirror, reposted at Phoenix Online and other websites. Both the Mirror and The Paper, it seems, were racing to get this story out after it emerged on social media. New media expert Xu Danei told Foreign Policy in 2014 that he believed The Paper was out to compete with Hu Shuli’s Caixin for market share, though the former would try to offer broader coverage. “Coverage” at The Paper is certainly broad, as my morning study shows. But even if The Paper is an effective “new bottle,” its interface surely won’t be enough to differentiate it and make it relevant over the longer term. So how does its reporting stack up against that of Caixin? Caixin, in fact, needs only 15 seconds against my entire morning with The Paper. When I go to Caixin.com, the first piece at the very top of the site is an exclusive, a hard news piece looking into the problem of fraud in claiming subsidies for new energy vehicles in China. I won’t count out The Paper just yet. And the app is installed on my iPhone. But Caixin has me hooked on the real stuff. Time to make another pot of coffee. David Bandurski is co-director of the China Media Project and a Richard von Weizsäcker Fellow at the Robert Bosch Academy. A research program focusing on current developments in China’s media landscape, in partnership with the Journalism & Media Studies Centre at the University of Hong Kong.